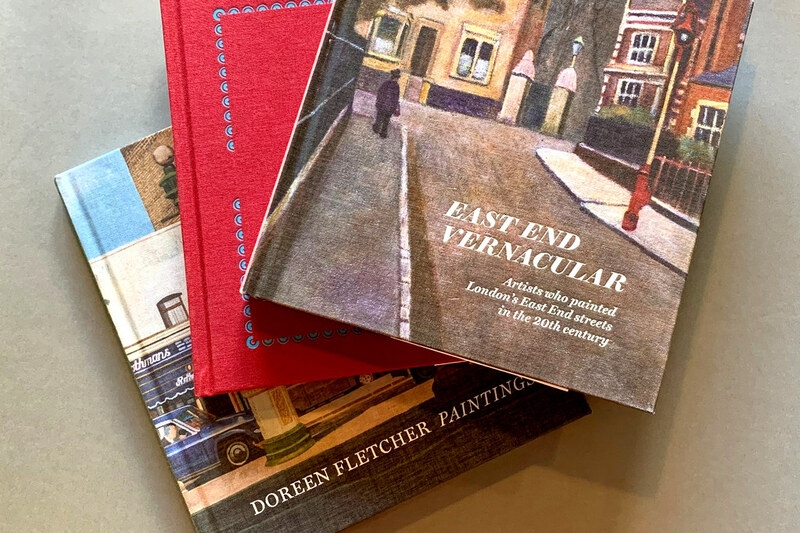 Three recent publications include paintings by Doreen Fletcher, a collection of East End artists and a memoir by ‘Cockney Sikh’ Suresh Singh. The design of all three casebound books is by Friederike Huber, using typefaces by Matthew Carter and Commercial Type. Cover and spreads for Doreen Fletcher: Paintings. Spread showing Train through Park, Stephney, 1987. 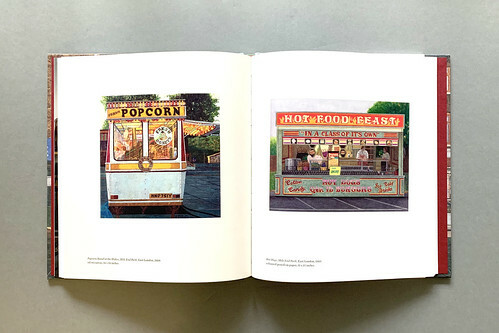 Spread showing Popcorn Stand at the Wakes, Mile End Park, East London, 1994 (left) and Hot Dogs, Mile End Park, East London 1993 (right). 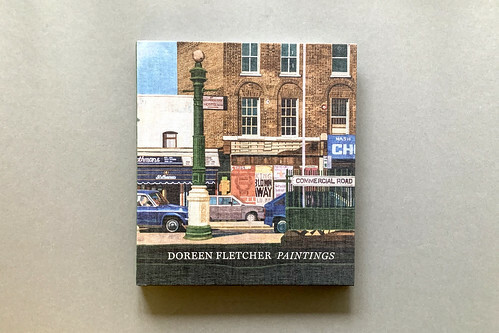 Doreen Fletcher: Paintings (Spitalfields Life Books, £20.00), is a survey of the endearing urban landscapes that Fletcher has been patiently producing since 1974. Despite some early acclaim, Fletcher’s work seems to have flown below the radar, and in the early 2000s, she stopped painting. The new book, which coincides with a solo retrospective of her work at the Nunnery Gallery in East London, is buoyed by the fact that Fletcher has since picked up the paint brush again. Showing works from the early 1970s to the present day, the book is a well crafted hardback that complements the works within. Fletcher’s paintings, together with her astute and anecdotal captions, capture the shifting landscape of London’s East End – many of Fletcher’s subjects no longer exist. 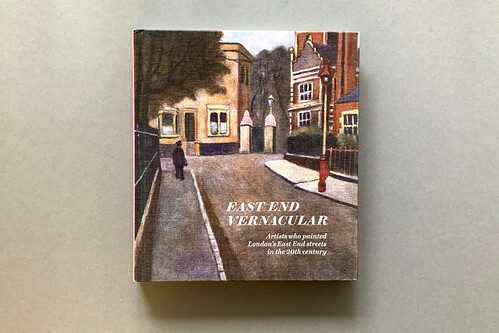 Cover and spreads for East End Vernacular: Artists who painted London’s East End streets in the 20th Century. Spread showing John Allin’s Schoolyard, 1968. 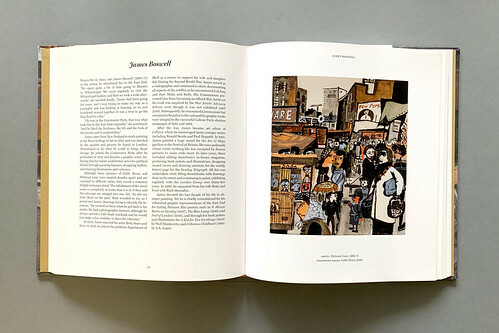 Spread showing the biography on James Boswell and his Petticoat Lane, 1962-06. 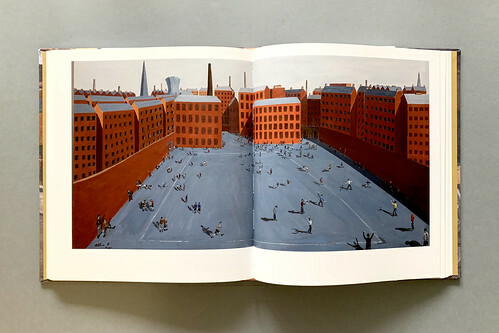 In a similar vein, East End Vernacular: Artists Who Painted London’s East End Streets in the 20th Century (Spitalfields Life Books, £25.00), is a moving record of East London’s shifting character through the work of 30 painters. 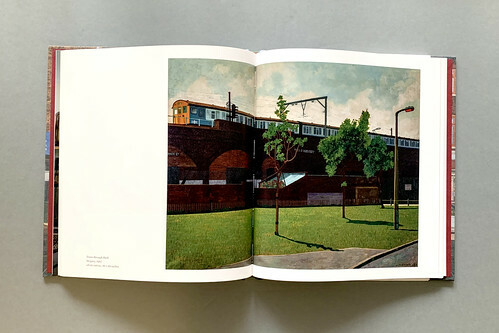 Peri Parkes’s melancholic portraits of Stepney and Bethnal Green in the 1980s tell the story of a city that has moved well past the postwar optimism found in Rose Henriques’s Fait Accompli, Berners Street (1951). But the book is more than a catalogue of changing scenery. Each section provides a page of biography, revealing the ways in which an artist’s narrative interweaves with that of East London: the social work of Dan Jones, for example, or Albert Turpin’s pleas to the East London Advertiser, in which he emphasised the importance of preserving people’s memories. The prologue and epilogue include additional images by Whistler, Doré, Lucinda Rogers, Adam Dant and others. Rodgers’ ‘View over Spitalfields looking West’ (2001-02) – with its cranes looming over London’s ever-expanding skyline – reminds us that nothing is more familiar to the East End than change. 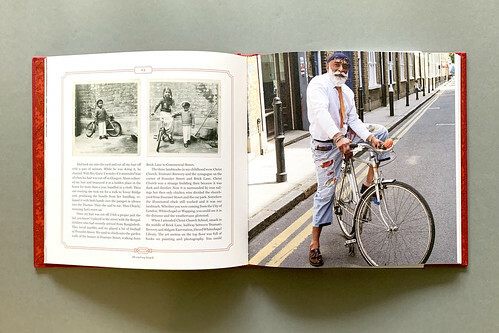 Cover and spreads for A Modest Living: Memoirs of a Cockney Sikh by Suresh Singh (Spitalfields Life Books, £20.00). Spread showing images of Suresh Singh at childhood and later life, labelled ‘Me and my bicycle’. 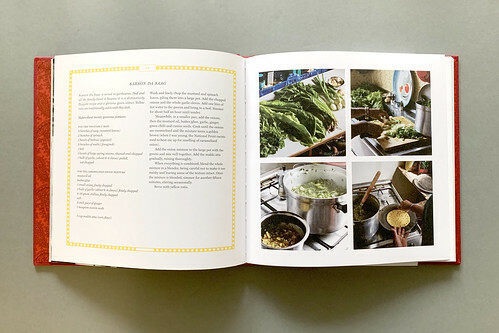 Spread showing Jagir Kaur’s recipe for Sarson Da Saag, a meal loved by the family ‘because it is a distinctively Punjabi recipe and a glorious green colour’. Suresh Singh’s A Modest Living: Memoirs of a Cockney Sikh (Spitalfields Life Books, £20.00) is an autobiographical story of family life, written in awe of his father Joginder Singh, who moved to Spitalfields in 1949. Singh tells this story on the occasion of leaving 38 Princelet St, their family home of more than 70 years – where his father died and he was born. The book provides a personal account of life growing up as a Sikh in London’s East End during the 1970s, touching on the subjects of race and identity, and his time as the drummer (‘Hero Shema’) in punk band Spizzenergi. Singh articulates his feelings of living in a foreign land, and those of becoming a ‘Londoner’. 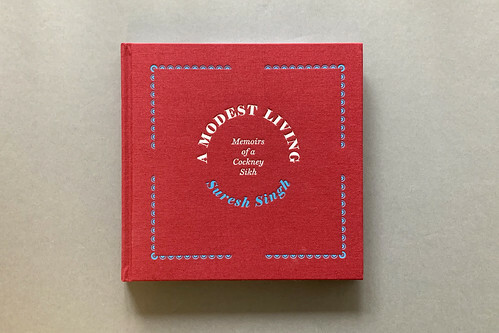 Local landmarks are referenced throughout the narrative, and recipes by Singh’s wife Jagir Kaur are weaved into the story; it is a heartfelt documentation of love and admiration for people and places. 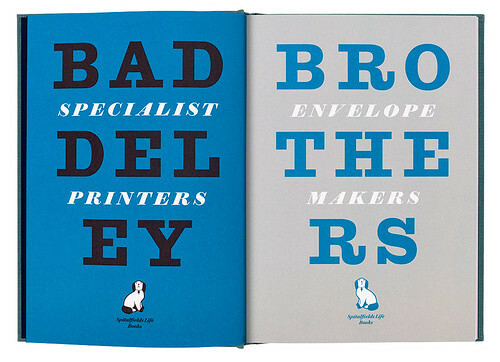 For more about The Gentle Author’s indefatigable industry, see ‘Out of the shadows’ on the Eye blog — or ‘Stamped in the memory’, about his book on the family-run print specialists the Baddeley Brothers, in Eye 91. Opening spread from Baddeley Brothers by The Gentle Author, set in Antique No. 6 and Brunel Deck Black Italic by designer David Pearson. The book is typeset in Adobe Caslon Pro, Caslon Doric and Caslon Sans Shaded Number 2.